Offering vacation itineraries of seven to 21 nights, Uniworld‘s River Countess cruises the Netherlands, Hungary, Germany, Austria, Romania, Bulgaria and Serbia along the Rhine, Main and Danube Rivers. Launched in 2003, she is 360 feet in length and capable of carrying 134 guests in 67 staterooms and 4 suites. One of the Category 1 Staterooms River Countess. 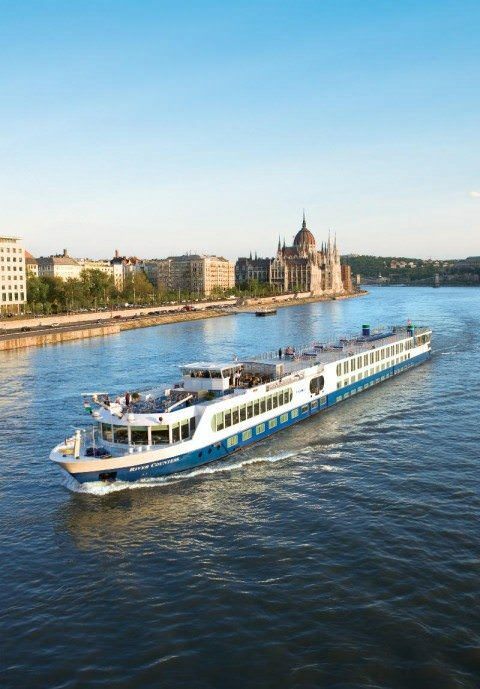 Photo courtesy of Uniworld Boutique River Cruises. 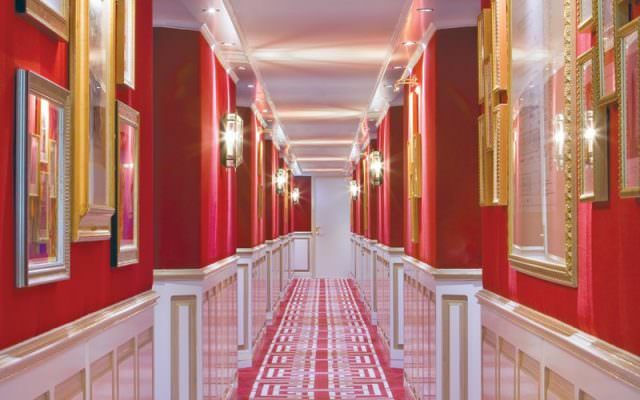 There are five stateroom categories aboard River Countess and one suite category. Lavishly appointed riverview staterooms and suites have handcrafted Savoir® of England beds draped in 100% Egyptian cotton linens and European duvets, along with a menu of pillow choices. Stateroom and suite amenities include: generous built-in closets, hair dryer, individual climate-control thermostat, direct-dial telephone, flatscreen TV with infotainment center, and safe. 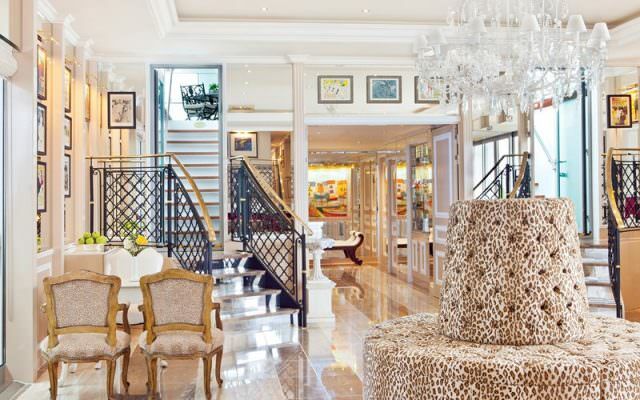 The stunning reception lobby welcomes guests aboard Uniworld’s River Countess. Photo courtesy of Uniworld Boutique River Cruises. River Countess features wireless internet access throughout, as well as a lounge offering panoramic views, a bar, an elegantly appointed dining room, and a library. Out on deck, passengers will find ample space for sunning and sightseeing including three “sun tents,” as well as a fitness room, spa, and shops. Guests also have the use of complimentary bicycles and Nordic walking sticks while ashore. River Countess was named one of the world’s “Top Small Cruise Ships” in the Conde Nast Traveller 2010 Reader’s Poll. River Countess also features a dry sauna and steam bath for passenger use. 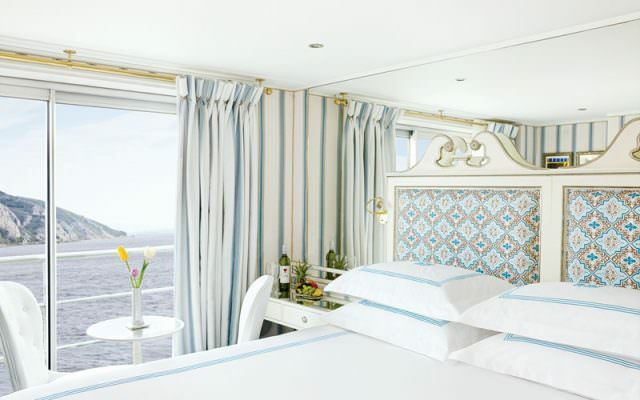 French balconies were added to all staterooms on Rhine deck in 2010. Inside, River Countess features plenty of soft wood colors for an interior design that is elegant and pleasing. The covered Sky Lounge allows for panoramic, outdoor views in inclement weather. Read other articles about the River Countess.